I think I mentioned that the last time we went camping there was a burn ban, so there were no s'mores. I really don't get the purpose of camping without s'mores. If you look through the archives it won't take you long to find out that I love s'mores. So camping or not (and I prefer not) there is always a good reason to have a s'more. So here are some fun new s'more recipes you might want to try this summer. 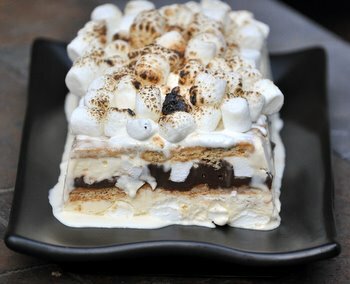 If you are looking for something to help you cool off, the s'mores ice cream terrine from Baking Bites is a good recipe to start with. 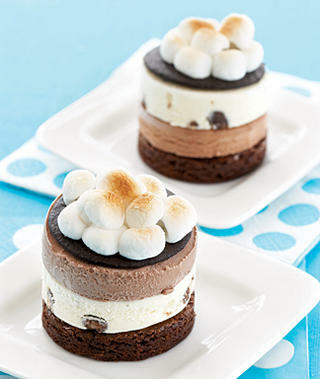 And if you happen to have a miniature springform pan, you can try frozen s'more snack from Woman's Day. Or you can combine the two ideas and use the miniature spring form pans with the terrine recipe. You know, if you want to go crazy! I love that terrine! Can you check the link for Baking Bites? It isn't linking to the site. Randi, I fixed the link. Thanks for the heads up! oh, those are so adorable. Does it matter what kind of ice cream you use? I had another recipe that said you couldn't use a certain type of ice cream because it didn't hold properly? something about added texturants I think. Boy oh boy! This is going in a summer favs to try. I've missed stopping by for your fab inspiration.